When I arrived at House of Gourmet at around 6pm on a Wednesday night , the restaurant was very busy. Nevertheless, I was greeted at the front door right away and was on my way to being seated in no time. It wasn’t exactly a "first come, first served" process though, since they were trying to maximize the number of people sharing a table. Knowing that Michelle would still be a while before she arrived, I wasn’t in a hurry to sit down so I let a bunch of people go ahead of me. In gratitude for my patience, one of the waiters told me he’d reserve us the next two-seater that became available (on the side) so that we wouldn’t have to share a table. I don’t mind sharing a table, but it was a wonderful gesture and a great first impression! When Michelle arrived, we ordered their Steamed Rice Rolls with Fresh Shrimp (#113 — $3.99), Roast Pork & BBQ Duck on Rice ($4.99) and Cantonese Chow Mein (#381 — $10.50). For the most part, the food was very decent and respectable. But given their similar layout and format, we couldn’t help but to compare everything to King’s — and there’s just no comparison, not even close. Apart from the shrimp rolls which were appropriately priced at half of what King’s charges, the prices were very comparable. We would have been better off going to King’s where the quality and taste is unquestionably superior, but it was still a very cheap meal so we weren’t complaining. All in all, a very valiant effort, but it wasn’t going to take our business away from King’s anytime soon. Even still, it wasn’t a terrible meal by any means, and while I knew that House of Gourmet was never going to compete at the same level as King’s Noodle Restaurant, I felt like they had earned a second visit. Maybe it was better for lunch? Maybe their noodle soup was better than King’s? Maybe there’s one thing that they do really well that would hook me? On my second visit, I went by myself at around 2:30pm on a Thursday afternoon for a late lunch. I was able to take a lot more photos the second time around. Again, I was greeted at the front door right away and this time, seated at a large table for nine closer to the back. It was a lot less busy than my first visit, such that I could make out the classical music playing in the background. I took a long time to look over the menu (more out of curiosity than anything) but when I was finally ready, someone was there to take my order right away. My waitress didn’t know what I was talking about when I ordered by number, so I just had to point to what I wanted on the menu. Maybe she was new, or maybe that’s just the way they operate, I don’t know. After drinking some nice, hot Po Lei Tea (which I love, especially on a cold day), my Wontons, BBQ Pork & BBQ Duck with Egg Noodle in Soup (#211 – $7.99) didn’t take very long to arrive. The soup came with lots and lots of BBQ pork, but unfortunately, not so much duck and just three wontons. I would have much preferred it the other way around – more duck, less pork. The BBQ pork was very meaty but a little tough and much too dry. Very dry! The noodles, as I expected, were nowhere near as good as King’s. Not only in taste, but especially in texture. The noodles were not exactly mushy and still very decent, but much too soft for my liking. 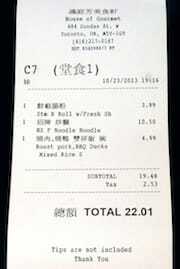 In addition to the soup, I also ordered Fried Shrimp Dumplings (#53 — $7.99). As soon as it arrived, I wanted to send it back and ask for another one, but I always have a hard time doing that. (I suppose I’m afraid the kitchen will do something to it out of spite the second time around, so I figure it’s just safer to take it as it is…) As soon as I touched the plate to reposition it, I noticed the plate was very grimy and dirty especially under the plate, but also along the rim by the mayo sauce. Very gross! In hindsight, I definitely should have said something. The dumplings had a much different flavor than I was expecting – very different from everywhere else – but it had lots of flavor and was a nice change. It turned out to be because they put sliced mushrooms in with the shrimp. Delicious! Unfortunately, however, it also meant that since mushrooms hold a lot of moisture, the dumplings were a little soggier than they should be. The tops of the dumplings were very crispy and crunchy, (and the oil was evidently clean and fresh) but the body of the dumplings were noticeably soggy. I did enjoy the mushrooms in these, but I’m not sure it was a worthwhile trade-off. Texture matters! it’s hard not to compare the food at House of Gourmet to King’s, and it’s hard not to notice that they fall a little short in almost every way, but it’s still a very decent meal and you could do a lot worse. One major difference I noticed and very much appreciated, was that they don’t bring you your bill half-way through your meal. I’ve never liked that about King’s, even if I do understand the reasoning behind it in a place so busy. Instead, at House of Gourmet they give you a little plastic tag with your table number and seat/bill number when you place your order and you take it up to the front counter at the end of your meal when you’re ready to pay. It still keeps things organized and less confusing for the staff (especially given all the table sharing) without negatively impacting their customers. Getting the bill two minutes into my meal has always felt very "GTFO, hurry up and leave!" to me, even though I know that’s not the intention. This is a much better solution. 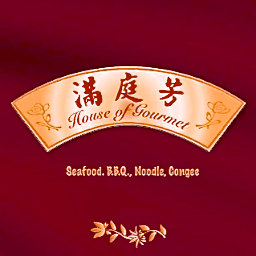 I won’t say the service at House of Gourmet left a lasting impression on me, but I will say that it was above-average compared to many other restaurants in Chinatown. I took Michelle’s new iPhone 5S with me into the bathroom on our first visit to take some photos (this was before I got my own iPhone 5S). At around 7pm (relatively early in the evening) the bathroom was noticeably clean by Chinatown standards and I had no hesitations about using it. On my second visit however, at around 3pm after the lunch rush , the bathroom was a disaster, super dirty and very hard to convince myself to use it. (But when you gotta go, you gotta go!) Maybe they had a ridiculously busy lunch and hadn’t gotten around to cleaning it yet, but still – what a mess, even by Chinatown standards. Nevertheless, I’m glad I ventured out to try something new in Chinatown and I’m going to make an effort to continue doing so. There are so many great places in Toronto, it’d be a shame to not get out there and at least try to check them all out! House of Gourmet was published on Monday, January 13, 2014 at 5:46pm EST by Daniel Menjívar and last updated on April 11, 2018 at 9:30pm UTC .